– Was the employee on the clock? – Was the injury caused by an activity the employee is paid to do? – Was the employer benefiting by the employee’s activity at the time of injury? Our trucker in our example was on the clock, driving the truck to be unloaded for his employer and the employer would have been paid for this service; so unfortunately for the employer, they could be held vicariously liable for your injuries. Alternatively, if the trucker was using the truck for a personal matter, like helping a buddy move while off the clock without the employer’s consent, then the employer could likely not be held responsible under vicarious liability. A real life example of vicarious liability can be seen in the case of Pedro Diaz Rodriquez v. Enmanuel Parada, Business Solutions Transport, Penske Truck Leasing Corporation, and Does 1 through 30. In February 2012, Mr. Rodriquez was driving along the interstate when he was rear-ended by a commercial truck driven by commercial truck driver Enmanual Parada. Mr. Rodriguez sustained injuries to his head, spine, neck, and left elbow. He underwent cervical fusion surgery to repair his spine, and claimed to continue to experience pain as a result of the auto accident injuries. Mr. Rodriquez sued Mr. Parada since he was driving the commercial truck that hit him; Mr. Parada’s employer, Business Solutions Transport; and Penske Truck Leasing as they owned the Penske truck Mr. Parada was driving. Penske Truck Leasing was let out of the case, however, because Mr. Parada was not their employee. It was determined that Mr. Parada’s negligence caused the accident during the scope of his employment with Business Solutions Transport. – Mr. Parada was on the clock at the time of the accident. – Mr. Rodriquez’s injuries were caused by Mr. Parada’s driving of the commercial truck, an activity he is paid to do for Business Solutions Transport. – Business Solutions Transport was benefiting from Mr. Parada’s driving of the commercial truck at the time of Mr. Rodriquez’s injuries. By way of jury verdict, Mr. Rodriquez was awarded $3.8 million dollars finding Mr. Parada’s negligence was the substantial factor causing harm. Mr. Rodriquez likely hired an experienced commercial truck accident attorney to assist with his case so he received compensation for his injuries, past and future medical bills, and past and future lost wages from work. Attorneys who specialize in handling motor vehicle accidents involving commercial trucks understand vicarious liability, and how it relates to pursuing the rights of accident victims in court. 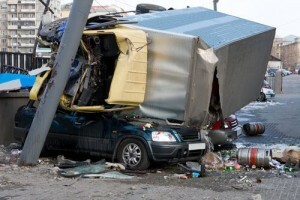 If you are involved in a crash causing injury or death related to the negligence or wrongdoing of a commercial vehicle operator, it’s in your best interest to consult a commercial truck accident attorney.